Beautiful detached home set high up with magnificent views from the terrace of Frejus and the rocks of Roquerbrune. 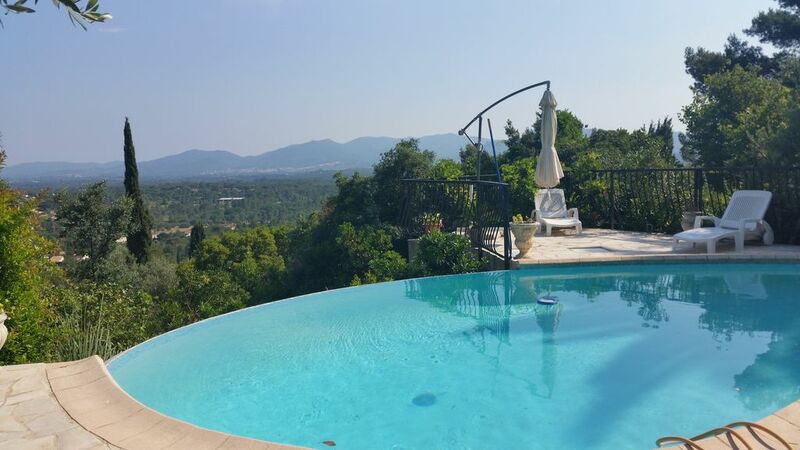 The villa is totally private surrounded by greenery two terraces and a private infinity pool with jacuzzi.The area is peaceful and very relaxing with a real provencal charm, whilst at the same time being within easy reach of Cannes, St Tropez and Nice. Horse riding, golf, sailing etc all available in the area. The house is tastefully decorated by an English Lady in the provencal style. As the area is called 'Corniche de Paradis' it sums up the area completely. When we arrived at the villa in La Bouverie (June 2011) we were not dissapointed. Very clean and very well equiped with everything you need to make a perfect stay in the South of France. A car is essential and there is a dedicated parking space undercover.The views from the balcony terraces were magnificent and made a perfect setting for eating and relaxing. The motor way is only a few kilometres drive, ideal for a day out. The garden is very private on all levels and the pool is bliss with the advantage of been cleaned twice a week. La Bouverie is only 2 3 kilometres away has everything you need, from a bakery, butchers and small supermarket, including two bars. There are no restaurants close by the nearest being a short drive away. The owners were very attentive and can be easily contacted, if necessary, by either telephone or wifi, both being free of charge. We would not hesitate in recommending this property to a friend. we've had an excellent vacation in this house. The view from the terrace is superb and the swimming pool is quite nice with the jetstream. The house is very well equippped and was very clean. Small supermarket and bakery can be found in not too far distance, so quite practical ! A house to relax in and enjoy !